As you walk toward the center of Aquacorde Town, Serena will call you to head over to the table on the left. There, you'll find four people, including the two neighbors you just met. The two other people are Tierno and Trevor. 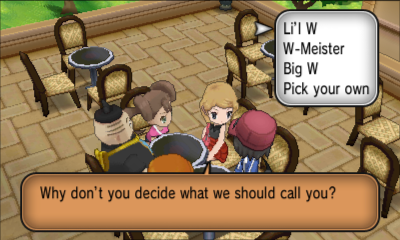 They spend some time trying to figure out what to call you (I went with "Lil' W"). After that, you get to choose a starter Pokemon! 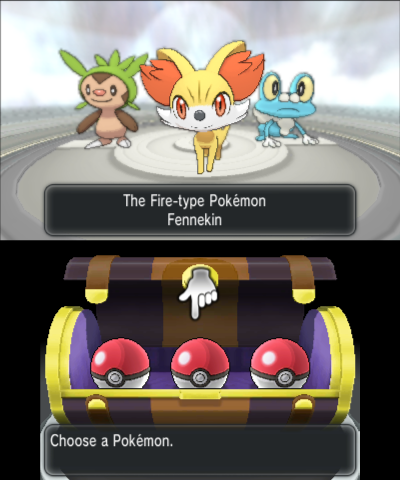 You're given the choice of Chespin, the Grass-type Pokemon, Fennekin, the Fire-type Pokemon, and Froakie, the Water-type Pokemon. I went with Froakie, because frogs are awesome. Shauna picks the Pokemon that's weak against yours. In my case, she picks Fennekin. Naturally, your rival, Serena, picks the Pokemon that's strong against yours. In my case, she picks Chespin. SPOILER ALERT: You'll be able to choose from another set of starter Pokemon very soon. So, look forward to that! 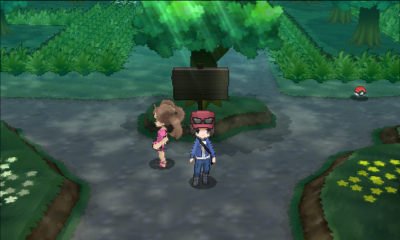 Then, you'll receive a Pokedex to track your Pokemon collection progress and learn more about Pokemon you encounter. Trevor also gives you the Prof's Letter, which he tells you to take back to your mom. Go ahead and go south to get back to your hometown. Before you leave, Shauna challenges you to a battle to test out your new level 5 Pokemon. This should be pretty straightforward, since your Pokemon dominates hers. After defeating Shauna, she'll heal your Pokemon for you and send you on your way. Go back home and Mom will approach you. Hand her the letter and she'll send you off with a packed change of clothes and a Town Map. 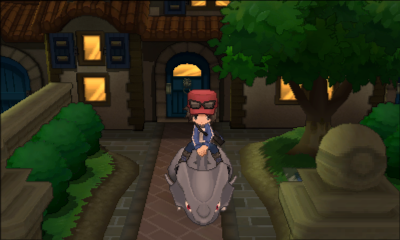 When you leave the house, the family Rhyhorn greets you. If you walk into it, you can even ride it! Now leave everything behind and start your Pokemon adventure! Head back north to Aquacorde City. In Aquacorde City, talk to the person near the water fountain to get a Potion, which heals 20 HP. The shop to the right of that guy sells these for $300 a piece. The building to the left of the shop has a guy who'll heal your Pokemon for free. West of the water fountain is a shop that sells PokeBalls for $200 a piece. Hold off on buying PokeBalls for now, since you'll soon receive free ones. 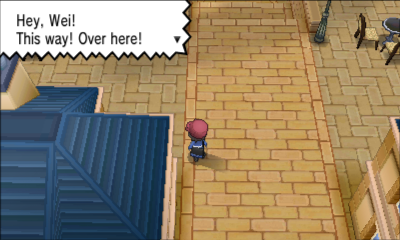 Now leave the city by heading north to Route 2. 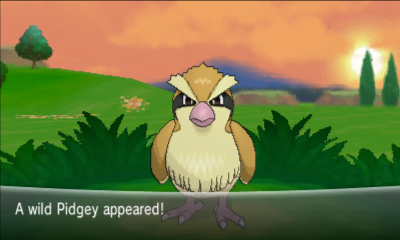 You'll encounter your first wild Pokemon on Route 2. These Pokemon are fairly weak. You can either train your Pokemon by defeating these wild Pokemon or catch them if you have PokeBalls available. In fact, you'll bump into Shauna and Serena again, who'll teach you how to catch Pokemon. After the lesson, Serena will give you 10 PokeBalls. Near the end of the route you'll bump into a trainer who'll battle you. He shouldn't be too tough to beat. After that, head north into Santalune Forest. Once you enter Santalune Forest, you'll be joined by Shauna, who'll follow you around. She'll help you out by healing your Pokemon whenever you talk to her. Pick up the Itemball on the ground, which turns out to be a Potion. Walk around. There are lots of Bug-type Pokemon in this forest. Head west from the entrance to pick up an Antidote in the grass. This will heal your poisoned Pokemon. Go a bit north from that and you'll find a Potion. On the east side, you'll find Trevor looking for wild Pokemon in the tall grass and Tierno challenger a trainer to a battle. As you head north, Shauna will pick up a Paralyze Heal from the grass and give it to you. Nearby, you'll fight Youngster Joey. Follow the route. You'll run into Serena, who'll give you a PokeBall. Soon after, you'll fight Lass Anna, who has a lv. 5 Pikachu. The Paralyze Heal you got from Shauna might come in handy in case Pikachu paralyzes your Pokemon. 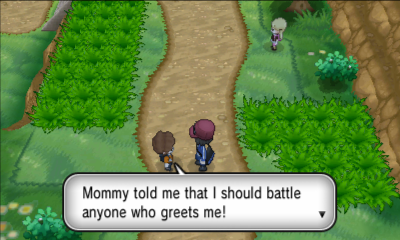 There's another trainer to fight right after her. 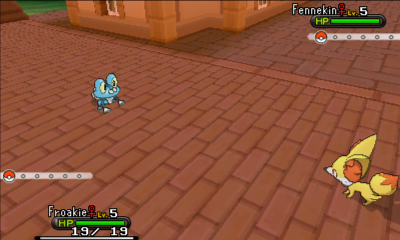 Then, pick up the PokeBall east of her and head northwest, picking up a Potion along the way. At the end of Santalune Forest, you'll meet up with everyone in your group again and walk to Route 3. Right when you enter Route 3, the group will talk some more and Serena will give you Adventure Rules containing useful tips. 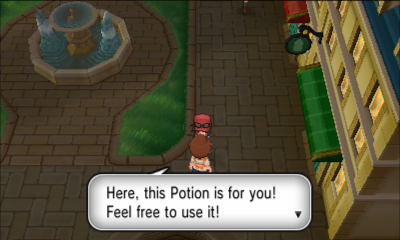 After that, you're free to explore Route 3 alone. There are quite a few trainers to fight and a few items to pick up. Soon after you'll be at Santalune City.